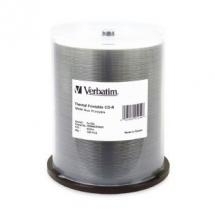 For sharp, clear graphics using colour thermal printers the preferred choice is Verbatim's CD-R White Thermal Printable, which supports full-surface edge-to-edge printing. 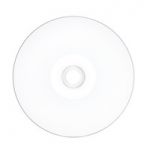 Best for use with colour thermal printers including Rimage Everest technology, these 52x speed CD-R discs have a white, thermal, scratch resistant surface. This surface optimises thermal printing for superb high-resolution reproduction of graphics text and logos. Ideal for CD duplicating, Verbatim CD-R colour thermal printable discs are available in 100-disc spindles. Can I use a normal printer with these discs? No, these can only be printed to with a thermal disc printer.